Salmon is not only delicious, but it’s also one of the most nutritious foods on the planet. Wild-caught salmon is packed with lots of vitamins and minerals and contains an exceptionally high omega-3 content. Here are a few ways eating salmon benefits your health. Boosts immunity – The combination of omega-3’s, selenium, and vitamins A and D help improve immunity both short and long-term. Eating at least two servings a week can help lessen the risk of chronic illnesses such as heart disease and diabetes. Enhances brain function – Regularly eating salmon can help reduce symptoms of anxiety and depression, protect fetal health during pregnancy, and decrease memory problems that happens with old age. Benefits heart health – Salmon contains polyunsaturated fatty acids, which when eaten, help improve serum cholesterol. Also, salmon is an excellent source of potassium, a mineral that balances blood pressure and helps keep your heart healthy. Keeps bones strong – The polyunsaturated fatty acids and vitamin D help to improve bone health, reducing the risk of fractures and osteoporosis. Helps lower inflammation – Eating fish protects your cells from DNA damage, plus, the vitamin D helps to prevent autoimmune disease. 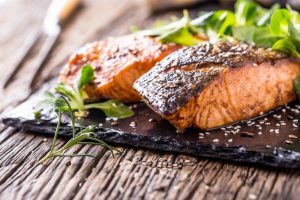 Aids in weight control – In addition to increasing your metabolic rate, salmon keeps you feeling fuller longer and prevents you from wanting to snack all the time. That’s because it’s a high-protein, low-calorie food. Whether you prefer your salmon sashimi style, in sushi rolls, or cooked over the teppanyaki grill, Shōgun Japanese Steakhouse wants to give you the ultimate Japanese dining experience. Located on International Drive, come and see why we’re the premier choice for Japanese cuisine! To reserve your table, call us at 407-352-1607 or book your table online through our website.